Anything that dates back to 1875 in the USA is truly ancient and therefore the Kentucky Derby has become a key part of American sporting history, tradition and heritage. Part of the Kentucky Derby Festival that lasts over two weeks, the Derby itself is the pinnacle of this and is watched by 160,000 people at Churchill Downs in Lousiville, along with tens of millions people worldwide. The winner takes home over $1.425M from an over $2M prize pool, making the one mile, 2 furlong, race one of the richest there is on the planet. Of course in America one of the only ways to bet is to be at the track, but in the UK and many parts of Europe we can bet on the big race form anywhere we wish to. As always with famous races like this the bookies pull out the stops when it comes to attracting your custom with offers. Therefore if you do want to place a wager on the Kentucky Derby make sure you get better value by looking through our carefully selected offers below. On this page you can also find everything you need to know about the Kentucky Derby, not forgetting there are plenty of other high grade races going on too, including the Kentucky Oaks the day before. Deposit and place a £5 qualifying bet at odds of 2.00 or greater within 7 days of opening a new account; excludes cashed out bets. Receive 2x £10 Free Bets, valid on set events only at odds evens+ or greater, expires in 7 days, plus a £10 Casino Bonus, expires in 7 days. Wager the Casino Bonus 40x to withdraw winnings. Credit or Debit card only. Geographical Restrictions. This deal can be claimed once daily for any sports market, back a £10+ 4/1+ winning singe (can be an acca) and get a £5 free bet valid for one week for any sports on top of your winnings. All accas with six or more selections (1/2+ each) pick will be refunded up to £25 as a free bet (valid 7 days, £2 minimum) should one selection let you down. This can be combined with football and greyhounds too. British people are not naturally insular in nature, yet when it comes to sporting events there has to be something particularly interesting about them in order for them to be well-known on these shores. That is even more true in the world of horse racing, given that British racecourses boast some of the most-watched events anywhere on the planet. From the Grand National through to the Cheltenham Festival via the 1,000 and 2,000 Guineas, you’d be hard-pushed to find a country that takes its racing as seriously as we do in the United Kingdom. As you’d expect, however, every country is proud of their own events and in the United States of America they have good reason to be. 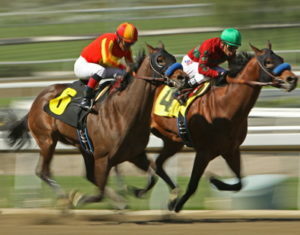 The Kentucky Derby takes place annually on the first Saturday of May, but it’s part of a much bigger event. Understandably named in the major race’s honour, the Kentucky Derby Festival lasts for a fortnight and the chief race comes at the end of that period, once everyone’s attention has been earned. It’s variously known as either ‘the fastest two minutes in sport’ or ‘the most exciting two minutes in sport’, so we’ll look at why it’s held in such high esteem here. Though the Kentucky Derby began life began raced over the same distance as the Derby at Epsom, the race’s length was reduced to one mile and a quarter (1 mile, 2 furlongs) in 1896 and has been raced over that distance ever since. The record in the race was set by Secretariat in 1973, finishing it in 1 minute, 59 and two-fifths of a second on the way to winning the Triple Crown for the first time in two and a half decades. The race is only open to three-year-olds and is run left-handed around a dirt track. There is a weight of one hundred and twenty-six pounds for colts and geldings and one hundred and twenty-one pounds for fillies. In 2018 the purse for the race was $2 million and $1.425 million (~£1.06 million) of that went to the winner. 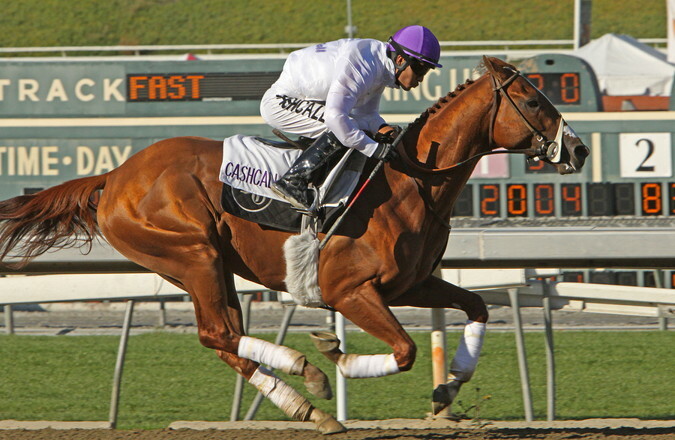 It is the most popular horse race in America, regularly surpassing the other Stake Races in terms of attendance. The Kentucky Derby is one of the most famous races on the plant and therefore it also has a prize fund to match it’s prestige. The prize fund has increased from $100k in the 1950’s to over $1 million by 1995 and now $2 million by 2018. Justify, the winner in 2018, took away over $1.425 million, equating to around £1.06 million. The payout for the runner up is in the region of $450k, approxiamtely $200k for third, $100k for fourth and $60k for fifth place. As is the case with numerous much-loved races, the Kentucky Derby has its history in one of the most popular events in England. The Derby was first run in 1780 at Epsom Racecourse in Surrey, so it was well-established by the time that the grandson of William Clark of the Lewis and Clark expedition travelled to England in 1872 and watched the race being run. Colonel Meriwether Lewis Clark, Jr. then travelled from Epsom to France and watched the Grand Prix de Paris at Longchamp, which had been the brainchild of the French Jockey Club. By the time that he returned to Kentucky in Louisville, Clark had decided that the area was ripe for some quality horse racing of its own, taking inspiration from what was happening in both Surrey and Paris. The result was the formation of the Louisville Jockey Club, which it was hoped would be able to raise money for some horse racing facilities based on the outskirts of the city. A track was built and quickly became known as ‘Churchill Downs’, in honour of Henry and John Churchill who had given over the land for it to be built on. As an aside, it didn’t officially take on that name until 1937 but was known as it colloquially almost from the moment that the venue opened its doors. The race was run for the first time on May 17th in 1875, with a field of fifteen three-year-olds lining up in front of around ten thousand spectators. It lasted for a mile and a half, which was the same distance as the Epsom Derby was raced over, and the inaugural event was won by a jockey named Oliver Lewis on the back of Aristides. Though widely considered to be successful, the Kentucky Derby didn’t take the US by storm in the way that Clark may well have been hoping. Indeed, by 1894 the Churchill Downs track had run into financial difficulty and it required an injection of capital that saw the New Louisville Jockey Club incorporated. Despite the fresh money being ploughed into the event, it still struggled to catch the imagination of the American public in any real sense and the business began to struggle. It wasn’t until a syndicate of businessmen was created by Colonel Matt Winn in 1902 that Churchill Downs began to gain more attention, with the Kentucky Derby going on to become the most-respected race for three-year-old thoroughbreds in the US. 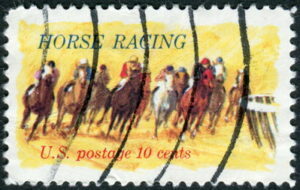 Once the Kentucky Derby began to gain the respect of the horse racing industry in America, the race’s winners began to be sent to compete in other events elsewhere in the country. Soon two other races started to be enjoyed by the best of the thoroughbred owners, which were the Preakness Stakes and the Belmont Stakes. The former took place at Baltimore’s Pimlico Race Course, whilst the latter was based in the Elmont district of New York. The races gained publicity because of the large stakes on offer in each, but it was in 1919 that they truly began to be enjoyed by the American public when Sir Barton won all three in the same year. The term ‘Triple Crown’ wasn’t used until 1930, when a sportswriter named Charles Hatton began to fuel the public’s interest in the possibility of a ‘super horse’ winning all three of the major races. Talk of the ‘Triple Crown’ began in the weeks that preceded the Kentucky Derby and soon started to grip the nation, eventually leading to the schedule of the Derby changing from the mid-May to the first Saturday of the month in order to ensure that the Triple Crown’s races would take place in a specific order. The Kentucky Derby has been first, followed by the Preakness Stakes and finally the Belmont Stakes ever since 1931. As mentioned earlier, the Kentucky Derby is the headline race of a Festival named in its honour. It is the largest single event to take place in the Commonwealth of Kentucky and first began in 1935. Initially it only lasted for two years, but the event was restarted in 1956 and has taken place ever since. When British horse racing fans hear the word ‘Festival’ in association with the sport they inevitably think of the four days of racing that surrounds the Cheltenham Gold Cup. In America, the word has a more literal meaning and racing take place alongside celebrations in general. There is a balloon race, for example, as well as a steamboat race and also one of the largest parades in the country. Arguably the most thrilling moment of the fortnight, aside from the Kentucky Derby, is the Thunder Over Louisville firework display, which is the largest such event in North America. There are numerous sporting events that take place during the two weeks of the Kentucky Derby Festival, with a pro-am golf tournament being chief amongst them since 1974. Another big event is the mini-Marathon and the Marathon, which take place on the Saturday before the Derby and welcomes some of the biggest names in the discipline of Track and Field in the States. Perhaps one of the most amusing events is the ‘Run for the Rosé’, during which waiters and waitresses have to run an obstacle course with trays full of pink wine, which is a tip of the cap to the nickname of the Derby as the Run for the Roses. The race itself gets that name because the winning horse is draped with a garland of the flowers. As you can imagine for a race that has been taking place since the 1870s, the Kentucky Derby has racked up a number of accompanying traditions over the years. For starters, it has a drink associated with it in the form of the Mint Julep, which is an iced drink that is made up of bourbon, mint and sugar. Whilst it’s best served in an ice-frosted julep cup made of silver, most racegoers drink it out of a souvenir glass that was first available in 1939 and has been revised every year since, on account of the fact that it has all previous winners of the Derby printed on it. If you’re having a drink then you’d be best off lining your stomach first, with the food of the Derby being a thick stew of beef, chicken, pork and vegetables known as burgoo. You’ll be able to pick it up from numerous places, with the infield area of the track a popular place to head for those looking to gain general admission. That has always been the case, even though those in the infield area would have seen very little of the actual race prior to the installation of a Jumbotron screen in 2014. If mixing with the general public doesn’t suit then you might want to make your way to Millionaire’s Row, which is the area the rich and famous tend to occupy. The ‘Run for the Roses’ sees the horses compete not only to win the race itself but also the blanket of five hundred and fifty-four red roses that is given to the Derby winner. It is a tradition that began in 1883 when E. Berry Wall, a New York socialite, presented roses to the ladies in attendance at a post-race party, leading Clark to adopt the flower as the official one of the race. In the moments before the race begins there is a Call to the Post, after which the horses walk before the racecourse’s grandstand and the University of Louisville Cardinal Marching Band plays Stephen Foster’s “My Old Kentucky Home”. Once that’s complete, the Paddock Judge calls ‘Riders Up!’ and the jockeys mount their charges. Now that you know about the race, you might wish to know a little bit more about the venue that it takes place at. 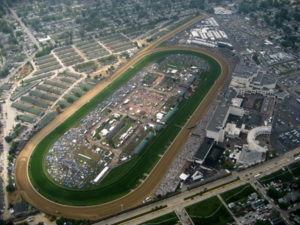 As mentioned earlier, Churchill Downs officially opened its doors in 1875 and has hosted the Kentucky Derby ever since. The land for the course was leased to Colonel Meriwether Lewis Clark Jr. by John and Henry Churchill, with the pair believing that it was likely to be a success in spite of the closing of two other racecourses in Louisville, Oakland and Woodlawn. Part of the reason for their confidence in its likely success was that it was based along railroad tracks, meaning that the competing horses could be transported to the venue with relative ease. Clark was forced to sell the track to William E. Applegate in 1894 when it was clear that he was struggling to fund it, with many changes to the venue occurring as a result. 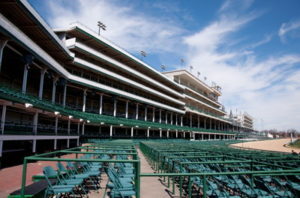 He commissioned the building of a new grandstand with twin spires, which would go on to become an iconic part of the course, as well as shortening the length of the Derby. Despite the fact that Applegate had made his money as a bookmaker, he wanted to rid Churchill Downs of its reputation as an area for gambling and so he turned over the day-to-day running of the venue to Louisville’s mayor in 1902. Part of the restructuring that Applegate carried out included the arrival of the aforementioned Colonel Matt Winn, who helped the race become one of the most-loved in America. Since the days of Applegate, Winn and Charles F. Grainger, Churchill Downs has seen many alterations to its makeup occur. 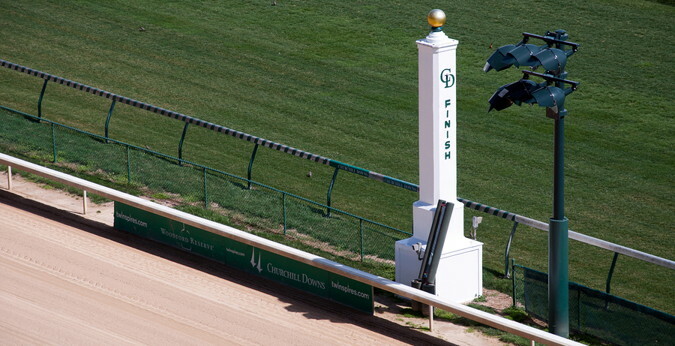 Even so, the twin spires of the grandstand remain in place and stand as a symbol of the history of the track and the famous race that takes place on it every May. Between 2001 and 2005, the racetrack underwent a makeover that cost more than $120 million, including the replacement of the clubhouse and the addition of luxury suites. Whilst the Kentucky Derby is undeniably the most important of the races that take place at the racecourse during the year, there is also the matter of the Kentucky Oaks that occurs o the Friday before. Should you ever wish to attend the course then you’ll also be presented with the opportunity to visit the Kentucky Derby Museum. 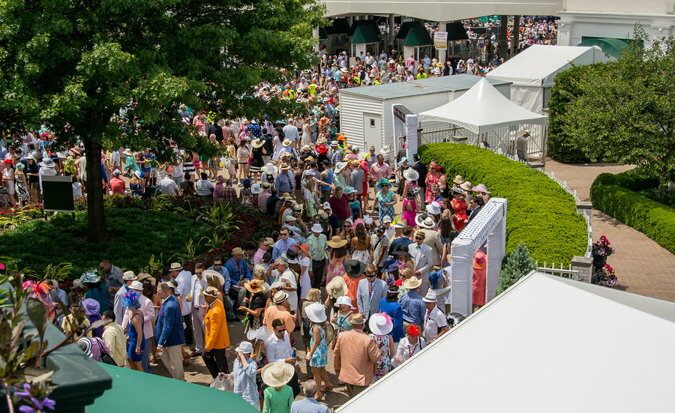 Derby day itself attracts a crown of nearly 160,000 people to the course with reportedly over $220,000,000 wagered on the event.